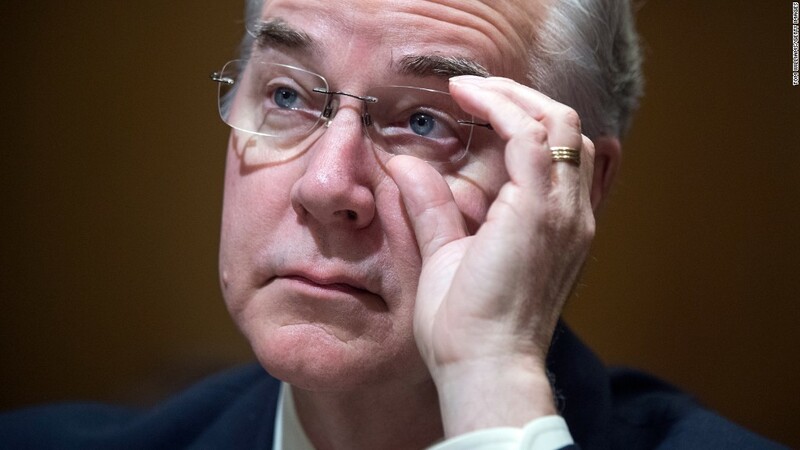 President Trump's health secretary pick acknowledged Tuesday that Medicaid may cease to be an entitlement for the nation's low-income residents if Republicans turn it into a block grant, sending a fixed amount of funding to each state. In a contentious hearing before the Senate Finance Committee, Democratic Senator Robert Menendez pressed nominee Tom Price on whether changing Medicaid into a block grant program would mean fewer people would be eligible in the future. Menendez noted Medicaid is currently an entitlement program, meaning anyone who meets the criteria has the right to be covered. "When you move to a block grant, do you still have the right?" Menendez asked. "No," Price said. "I think it would be determined by how that was set up." The question of what to do with Medicaid -- particularly how to handle the low-income adults who gained coverage thanks to Obamacare's expansion provision -- came up repeatedly during the hearing. Trump senior adviser Kellyanne Conway said Sunday on ABC News that the president is looking at turning Medicaid into a block grant program. Block grants would give more power over to the states to decide how to give out Medicaid funds and, experts say, reduce overall federal spending. Democratic senators defended the existing program, which they called crucial for many disabled Americans and low-income pregnant women, children and senior citizens. Nearly 73 million Americans are on Medicaid or the related Children's Health Insurance Program (CHIP). Under Obamacare, low-income adults are now allowed to sign up for Medicaid in states that expanded their programs. Republicans have long wanted to turn Medicaid funding into a block grant or a per-capita grant, where states receive a fixed sum for each participant. Several of the Obamacare repeal plans that have been floated in Congress -- including Price's 2015 Empowering Patients First legislation -- also call for eliminating Medicaid expansion. Trump listed turning Medicaid into a block grant program on his campaign and transition websites, and Conway's comments Sunday affirmed that it's on the top of the new president's list. Democrats fought back at Tuesday's hearing. "I feel like the Administration is creating a war on Medicaid," said Senator Maria Cantwell. Price acknowledged Medicaid is vital, but said it is troubled. Later, he said that the federal government should leave it to governors and state insurance commissioners on how best to cover their low-income residents. But he said he supports making sure that any replacement bill would provide coverage options for every American, including those now at or near Medicaid eligibility. Block grant proposals usually provide more flexibility for states to tailor their programs to their residents' needs. While the federal government has set a floor for who must be covered and what services must be provided, states currently have some leeway to widen eligibility to more people and to cover more services. They can also impose some requirements to qualify for care, such as mandating co -payments, though the Obama administration has turned down some governors' requests. Since one goal of block grants is to slow the growth of health care spending, states could likely wind up with less funding than they have now. Then they would have to choose how many residents to cover and what benefits to provide. Supporters worry that will erode the safety net that the nation's largest health care program provides. "It's telling states, here's the amount of money we'll give you. You figure out how to take care of 70 million people," said Sara Rosenbaum, professor of health policy at George Washington University. But those who want to reform the program say that block grants will force states to be more efficient in covering their low-income residents and end the incentive for states to pad their programs in order to receive more federal funding. Medicaid and CHIP cost $532 billion in fiscal 2015, with the federal government shouldering 63% of the bill and states paying 37%. Lowering the cost of care makes the program more affordable, which would potentially allow states to cover more people, said Paul Howard, director of health policy at the Manhattan Institute. Governors, however, are mixed on the idea of block grants. While they are eager to gain more control over their Medicaid programs, many are not so hot on any kind of cap on federal funding. In a letter to House Republicans, the National Governors Association urged lawmakers to make sure any reform proposals protect states from unforeseen financial risks in their Medicaid programs, such as a recession, an epidemic or costly new treatments. "In considering changes to Medicaid financing, it is critical that Congress continue to maintain a meaningful federal role in this partnership and does not shift costs to states," Virginia Democratic Governor Terry McAuliffe, the association's chair, and Nevada's Republican Governor Brian Sandoval, its vice chair, wrote Tuesday.